[値下げ] Power Mover 2 | Mac App Storeのアプリ検索・ランキング BuzzMac! 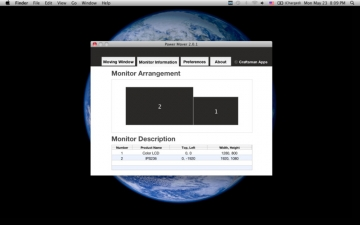 Power Mover is a utility for multi-monitor systems, designed increasing productivity on Mac OS X. You can easily move a window to other monitor when you have more than 2 monitors by using a keyboard-command (shortcut). It's useful for programmers, music engineers and traders and others. ● It provides multiple functions - To Next Monitor, To Previous Monitor, To Specific Monitors. 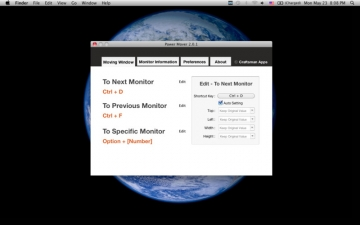 ● Unlike most similar applications, It can move a window to specific monitor. ● You can apply various options when moving a window - scaling size of the window, moving the window to (0,0) and so on. ● You can check out various information for your monitors. It can use moving-animation when moving the window. 1. Power Mover dialog doesn't appear anymore when you start up OS X. 2. Preference file bug is fixed.